Description: HIPAA Education: Learning HIPAA in an Attention Deficit Digital World! September's webinar will describe and provide examples of how to quickly come up to speed on the HIPAA Regulations through HIPAA "Shorts!" It will also continue to explore the meta-concept of "How much HIPAA training is enough!" that was initiated and well-received in the August webinar. Last month's newsletter and webinar (HIPAA Education: How much is enough?) explored this idea (Handouts can be obtained here). However, what we didn't make clear is that we will be exploring this idea over the next several months. It's a meta-concept. One newsletter and webinar is not nearly enough to cover the topic. Moreover, we intend for this exploration to be interactive. This is not a series of "lectures" but rather a series of interactive sessions with audience participation where we jointly and collaboratively iterate in an attempt to find an answer that approximate the reality for your specific organization. Each organization is different. This topic is the canonical example of a wicked problem. There is not a one-size-fits-all answer. Learning HIPAA in an Attention Deficit Digital World? Universally employees complain about not having enough training, or the right training, in just about any subject matter domain you can name. HIPAA is no different. We know! We have literally trained thousands of customers in HIPAA over the last 10 years, including most of our competitors. Having said that we still get the same comments: (1) it's too legalistic; (2) it's not dumbed down enough; (3) it's more for compliance officers than for clinicians; (4) it's too long, etc. Are these customers right? Yes and no. Why? Because it's impossible to design comprehensive training in a manner that will be best, or even satisfactorily suited, for all audiences. But do customers get significant value from our training? Absolutely, that's why they buy. This newsletter only uses our training as a point of reference. We are responding to the market by adding a series of HIPAA Training Modules for Clinicians. But that's also not the subject matter of this newsletter. What this newsletter wants to explore is the question of learning "modalities." We have all heard of them: (1) visual learners; (2) auditory learners; (3) tactile/kinesthetic learners, etc. These have been explored by researchers in breadth and depth for years now. However, what we want to explore in this newsletter, and in a series of upcoming products, is a different modality that we call "Shorts" but they go by a number of different monikers, including but not limited to the following: (1) bite-size learning modules; (2) short learning modules; and (3) micro-learning. The essence of Shorts is to take complex subject matter domains such as the HIPAA Privacy, Security and Breach Notification Rules, and break them up into smaller pieces to make them more accessible; to make them more digestible; to make them "fill in the learning metaphor de jure." The most interesting question for us (it's all fascinating) is what is the core learning dynamic (i.e. modality) in play? Why would taking an hour-long course and breaking it down in 15 minutes segments make it more accessible? Why would a 15-minute "Concept Short" broken down into 5 three minute "Idea Shorts" improve learning? Moreover what the difference between a "Concept Short" and an "Idea Short" and why should it matter. Who defined this grammar and why should we pay attention to these distinctions? The rest of the article will attempt to answer these questions with real-world examples that hopefully most of you can relate to. For example, assume that our Privacy Rule Training takes about an hour for the on-demand video to play. Assume further that you wanted to take the "open powerpoint" exam after watching the video. The exam is comprised of 20 True/False questions with a passing grade of 70. The latter being your organization's policy. Assume further, that as a job requirement (i.e. a term and condition in your employment contract) you needed to take all HIPAA training on your own time. So this hypothetical assumes that you need two hours time to get through the Privacy Rule. Finally assume that you are a recently graduated nurse, 27 years old, with a husband (or wife) and a small child at home. In other words, you are crazy busy. We believe that the answer to these questions lies more with the attention deficit digital world that we all now inhabit than with any significant breakthrough vis-à-vis a new learning modality (e.g. micro-learning). Millennials, especially if you believe the literature, prefer to learn via "Shorts" for the same reason that they prefer to shop online (something most of us now prefer); because it saves time. You may not have two hours to dedicate to learning the Privacy Rule in a comprehensive overview including taking a 20 question T/F test. However, you (i.e. the hypothetical nurse above) may have 15 minutes a night that you can squeeze in to watch a Privacy Rule "concept short." Watch all four concept shorts and you are ready to take the exam! Learning a little bit at a time takes into consideration the fact that none of us have enough time to do the necessary tasks we need to do, let alone extra things we might want to do. If you come home from a full day's work, fighting traffic, and want to spend some quality time with your spouse and children then there's very little time left for anything else. Remember that "quality time," as used in this example, does not include preparing or "fetching" dinner, helping the kids with homework or taking them to baseball practice. OK everyone in the audience has time commitments that differ from our hypothetical nurse, but the story remains the same. For other reasons, you still do not have enough time in the day to complete all the things you need to get done. So much for work-life balance. The majority of knowledge workers spend some time at night and weekends just to keep up. It's the 24/7 365 connected world that we live in that forces this reality upon us. Now having said that, we do not want to be dismissive of "Shorts" as a new learning modality. Far from it. None of us at 3Lions Publishing have PHDs in education nor have we performed an exhaustive review of the literature. There may be something that cognitively improves the learning process if shorts are used. We will leave that to the academics to sort out. What we know for a fact, is that the marketplace is demanding this type of training. We believe that the marketplace, in the aggregate, has figured something out that it will take academics years to corroborate (and to supply a theory that underpins it). Therefore having trained thousands in the HIPAA regulations, we intend to evolve our training into shorter and shorter "chunks" that we know are more digestible for an attention deficit consumer. However, we do not believe that these types of training are mutually exclusive. Quite the opposite. We look forward to rolling out our "Shorts" with a more interactive webinar experience that we pioneered last month. We will have more situational training exercises. We will focus more on the conveyance of "news that you can use" in "bite-size chunks." We intend to take the lessons learned from training thousands on HIPAA to innovate how HIPAA (and other compliance regimes) are taught. We hope that you join us on this journey. The following list of training modules are recommended for other workforce members, including the executive management team. Non-subscribers can download the HIPAA Handbook: A Definitive Guide of Articles from the HIPAA Survival Guide Store. For some the amount of information may be overwhelming, but just like HIPAA you bite off a piece of the elephant one at a time. We do NOT charge extra for compliance support like many of our competitors. The cost for your LIVE assistance is included in your Subscription purchase. 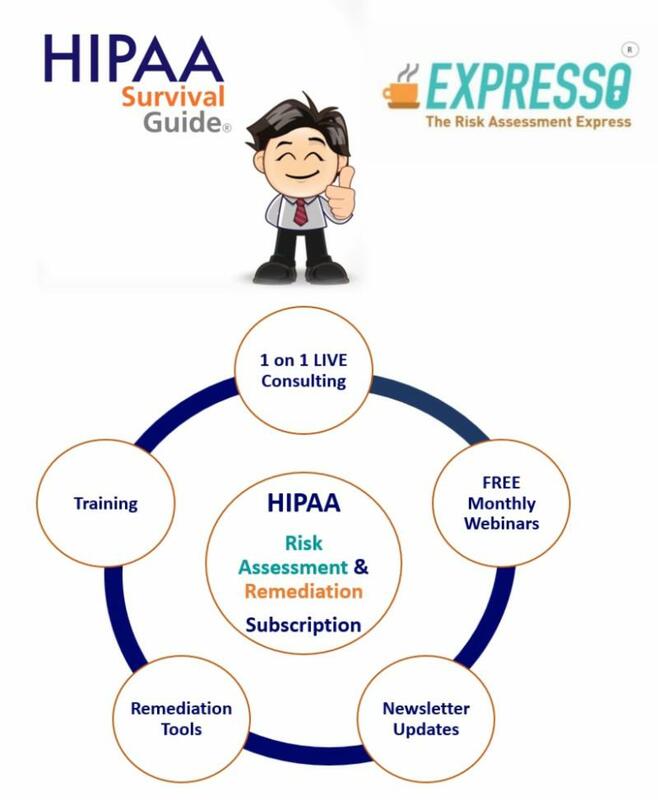 A full 360 degree circle of Risk Assessment and Remediation products are provided in 3Lions Publishing Inc.'s HIPAA and Expresso Subscription Plan.